Looking for a classic baked dessert? 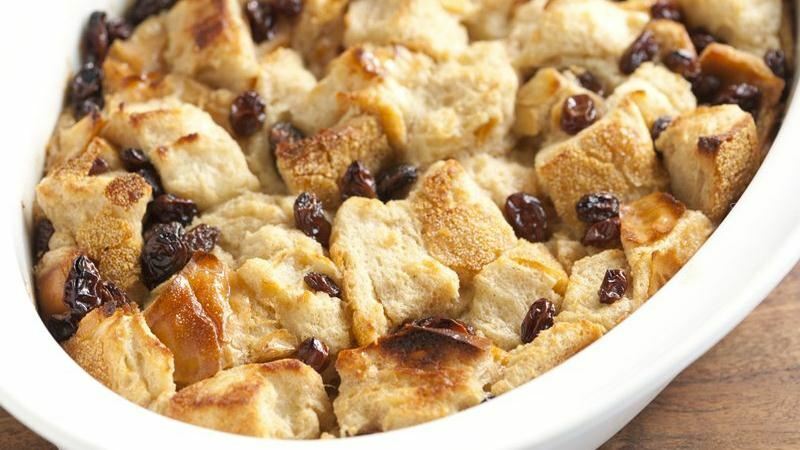 Then check out this delicious bread pudding that is ready in an hour. 1 Heat oven to 350ºF. In 2-quart saucepan, heat milk and butter over medium heat until butter is melted and milk is hot. 2 In large bowl, mix eggs, sugar, cinnamon and salt. Stir in bread cubes and raisins. Stir in milk mixture. Pour into ungreased deep round pan. 3 Bake uncovered 40 to 45 minutes or until knife inserted 1 inch from edge comes out clean. Serve warm with whipping cream.